A court jester, fair maidens and even an axe-wielding, hooded executioner were strolling around Wildwood Care Centre July 17 when the St. Marys, Ont. long-term care home hosted a medieval-themed event for residents. Staff members were out in full effect for the event, dressing up in a variety of creative costumes from the Middle Ages. The event was organized by Wildwood Care Centre’s life enrichment team. There was even a special lunch that was served to residents, who had the choice of chicken fingers, potato wedges and baby carrots, or spinach cannelloni and lima beans. 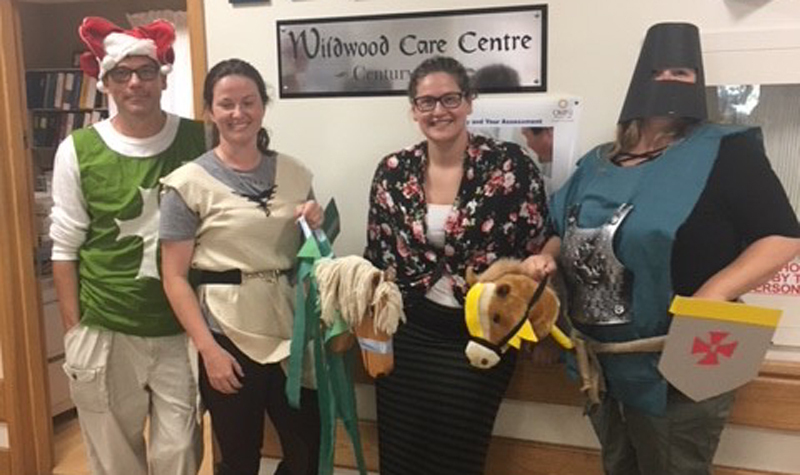 Residents were encouraged to eat their meals without utensils, in keeping with the medieval theme, Wildwood Care Centre administrative assistant Lisa Schellenberger. Residents were also invited to wear clothing reflecting the period, she adds. Other activities featured for the event included a javelin throwing activity and “slaying the dragon.” The day capped off with a screening of the film A Knight’s Tale, the 2001 loose rendition of Geoffrey Chaucer’s The Knight’s Tale. Most importantly, resident participation was strongly encouraged, Lisa says. “Residents received hats to wear to participate, (and there was) entertainment from our life enrichment department, complete with jokes from the jester and jousting matches,” she tells The OMNIway.